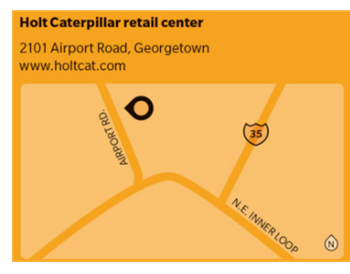 ​​​​GEORGETOWN – By the end of 2018, the heavy-equipment supplier Holt Caterpillar ​plans to construct a retail center at least a 60,000 sf at 2101 Airport Rd., north of the intersection of Lakeway Dr. and I-35. Georgetown officials said the project is still in the planning phase, as is a planned expansion of Airport Rd. into a four-lane roadway and a new water line. According to Holt Caterpillar, the company will create 129 jobs over the next ten years, and its presence will contribute more than $13 million in net value to the city. A new retail development, Pecan Branch, is also under development near the future Holt Caterpillar center. Go news shopping in Texas cities here.